The cutlet, regardless of its main ingredients, is one dish that never fails to impress by its crispy inviting looks. In these lamb or beef mince and potato cutlets, minced lamb or beef and potatoes combine together with a mix of green and dry spices and turn out a dish that releases a burst of gorgeous flavors when bitten into! The meat and spices, coated by the crispy yet soft texture of the fried potatoes can create an appetite for even the reluctant eater. Efficient cooks always multi-task so, while we are cooking the minced meat (as below) we will simultaneously set up the potatoes to boil. Wash thoroughly and then put the potatoes into a deep pot and cover with enough water so it is at least an inch over the potatoes. Add a teaspoon of salt to the water. Set up on medium heat and boil until you can easily pierce the potatoes with a fork. Remove and cool. Once cool, remove the potato skins and then mash thoroughly in a deep mixing bowl. To cook the minced meat: In a large bowl combine the mince meat with half a cup of water or milk and remove any lumpiness by mixing well with your fingers. Add the vegetable/ canola/ sunflower cooking oil or ghee to a large pan and set up to heat on medium to high heat. Add ginger and garlic pastes, the chopped green chillies. Give the whole mixture a brisk stir and then immediately reduce the heat to low. Next, add the chilly powder, the turmeric powder, the garam masala powder, and the cumin powder and stir for a few minutes. Keep the heat at medium to low. Add a few tablespoons of water to keep the mixture from burning or sticking to the pan. Keep stirring till the oil starts to separate from your masala mixture. Now, add the minced meat and follow with salt as per taste. Stir to mix well and keep flame at medium to low. Cover the pan for about two minutes and cook, then uncover and cook, stirring until all the water dries off. Remove from heat and keep aside. To assemble the cutlets: Once the cooked minced meat has cooled, add to it the bread crumbs and mix well with your fingers. Next, add the mashed potatoes and mix well again. Once done, divide up the mixture to form cutlets/ patties of approx 3” diameter by 1” cm thickness. Now heat the vegetable/ canola/ sunflower cooking oil or ghee in a shallow pan until very hot and fry cutlets in batches of 2 to 3. Fry the cutlets for about 2 minutes on each side on medium flame to obtain a light brown crust. Remove cutlets to a plate covered with kitchen towel to absorb any excess oil. 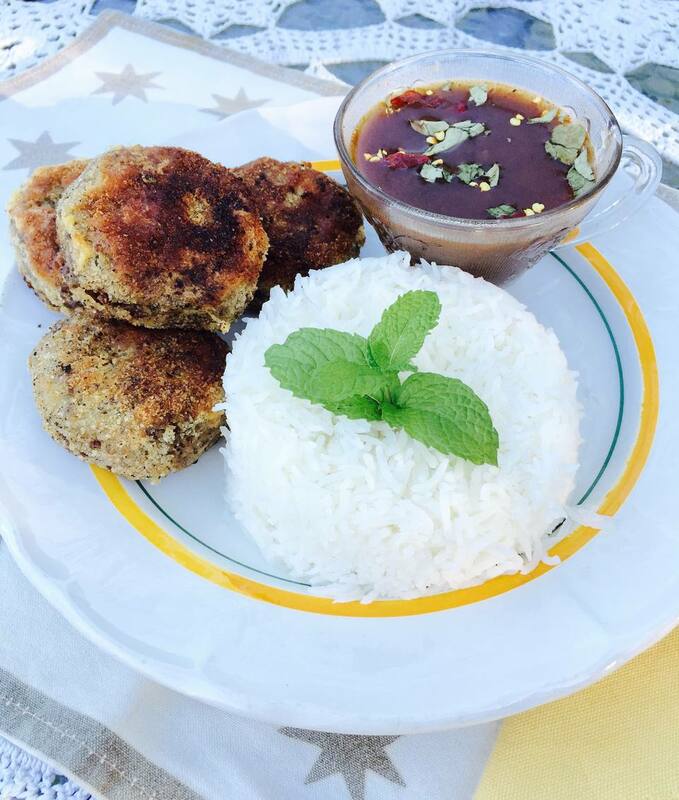 For a true blue Anglo Indian meal, serve these Lamb or Beef Mince and Potato Cutlets together with Rasam and boiled rice. Alternately, you could serve them with freshly made Parathas and sliced onions and tomatoes.